A story of tradition, devotion and culture. "The essence of a perfect spirit"
Love for traditions and the local area is fused with the ingenuity and passion of remarkable human beings, giving Andrea Da Ponte grappa and spirits a pure, noble essence: sublime sensations stemming from the art of distillation since 1892. Over one hundred years of passion, talent and devotion to a chosen land, cradle of exquisite grapes and precious distillates. Each day I draw inspiration from this magical place, looking at the future and keeping the same values I will teach my children. The new site of the Andrea Da Ponte distillery is dedicated to lovers of grappa, liqueurs and sparkling wines, it is a small world in which traditions, taste and innovation are intertwined. At this year’s event, the Andrea Da Ponte distillery presented one of the most significant additions to its selection: Riserva del Fondatore. In the early 1960s, Andrea Da Ponte’s grandson Pier Liberale Fabris created and began to hone an exclusive, totally unprecedented product that had never been made before: Prosecco. Riserva del Fondatore 5+ years was launched to celebrate the exceptional personalities of two brothers – Andrea and Matteo Da Ponte – with a single spirit. Thanks to their high quality and exceptional properties, Da Ponte products have received some of the top accolades and awards in Italian and international competitions. "An enchanting revelation for a privileged few"
The most intense and delicate varietal aromas of grapes are preserved in every drop of our spirits. The masterful magic of time and invaluable barrels of oak from Limousin – which are lovingly kept in the cellars of the Andrea Da Ponte Distillery – give this magnificent selection of aged grappa the unique character and refined, gratifying flavour that have made it famous and popular in Italy and across the globe. Savour the joys of age-old traditions every day with this selection of unadulterated, crystal clear grappa. The alcohol contents of the products vary, but they are all made from high-quality pomace by the extremely accomplished master distiller, who proudly holds the secrets to the sublime art set out by the invaluable Matteo Da Ponte Method. 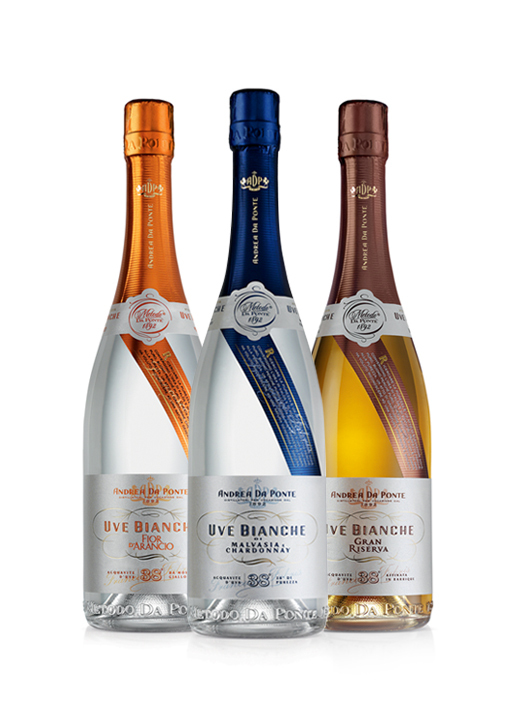 Produced in accordance with the Da Ponte Method in a continuous distillation process using a bain-marie still, these brandies encapsulate the exquisite essence of the grapes from the prized vines where they grow, such as Malvasia, Chardonnay and Moscato Giallo. In just a few drops, you can find all of the ancient traditions of the rolling Valdobbiadene hills. Dry and Extra Dry DOCG Prosecco Superiore Millesimato: two vibrant creations with fine beads to satisfy even the most demanding and refined palates. Equally delightful are the DOCG Fior D’Arancio sparkling wine made with sweetly aromatic Moscato Giallo grapes and the subtly sweet DOC Brut Venezia Rosé. indescribable sensations. It is steeped in peace, harmony and beauty.